Comet 202312A Centrifugal Clutch for V Belt. Heavy Duty. 1" Bore. Home > Comet Clutches and Parts > Comet 200182A Centrifugal Clutch. A or B Pulley. 3/4" Bore. > Comet 200181A. Self Contained Single Pulley. > Comet 202313A. Comet Industries 350 Series Drive Clutch. 7/8" Bore. > Comet 202312A Centrifugal Clutch. Heavy Duty Self Contained Single Pulley. Comet 202312A Centrifugal Clutch. Heavy Duty Self Contained Single Pulley. 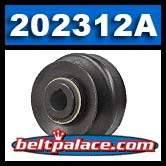 Comet 202312A Centrifugal Clutch for V Belt. Heavy Duty Self Contained Single Pulley. 3-1/2" Overall Diameter, 3" Diameter Pulley attached. Uses A or B Section V belts. Bi-directional functionality (inboard or outboard mount). Genuine Comet Industries Part NP35AB-10 CLUTCH S350. ORDER NOW FOR SPECIAL PRICE! Comet 200182-A. 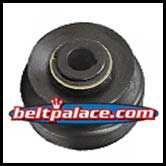 Centrifugal Clutch with 3/4" Bore v-belt clutch 200182A for 1/2" (A) or 5/8" (B) V-Belts. Replaces: Maxtorqe 3391104 (Rotary), carter bros, Stens 255-075. COMET INDUSTRIES PULLEY CLUTCH NP35AB 75 CLUTCH S350.